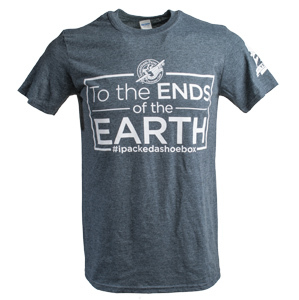 This charcoal gray T-shirt portrays where God has used Samaritan’s Purse to deliver shoebox gifts since 1993: “To the Ends of the Earth”! Made of 65 percent polyester and 35 percent cotton, it also includes the hashtag #ipackedashoebox as a reminder to share and tag photos of yourself with your packed shoebox gifts on social media. The left sleeve bears Operation Christmas Child’s 25th anniversary logo.